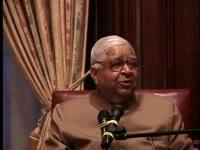 This public talk by S.N Goenka was given at the Harvard Business School Club in New York City in August, 2000. Since Goenkaji was himself a businessman for many years, he addresses many points of interest to the audience. The presentation is a suitable introduction to Vipassana for the general public and is followed by a lively question and answer session.